Courtesy of reddit.com is this fascinating nugget. 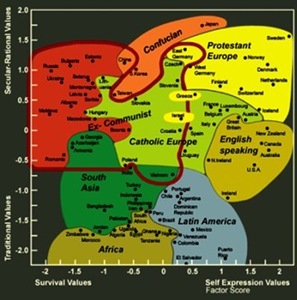 This map reflects the fact that a large number of basic values are closely correlated; they can be depicted in just major two dimensions of cross-cultural variation. An unusual way to look at the world, indeed. Finally, societies that rank high on self-expression values also tend to rank high on interpersonal trust. This produces a culture of trust and tolerance, in which people place a relatively high value on individual freedom and self-expression, and have activist political orientations. These are precisely the attributes that the political culture literature defines as crucial to democracy. This entry was posted on Tuesday, September 11th, 2007 at 6:20 pm and is filed under Civilization, Geopolitics, musings. You can follow any responses to this entry through the RSS 2.0 feed. You can leave a response, or trackback from your own site. I get where you’re coming from. Having done my time in the transport game myself I’ve seen a ton of crazy things then I’d like to mention. Thanks for the fantastic post. Took me time to read all the comments, but I truly enjoyed the write-up. It proved to be Extremely useful to me and I’m positive to all the commenters here It is always nice when you can not only be informed, but also entertained I’m positive you had fun writing this post.